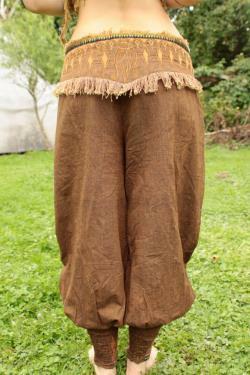 Now i use very special linen for those pants, but it is still gonna be brown and earthy. The belt gonna be looking as on the last 2 pictures without additional triangles like on picture 1. Very special , well fitting , made of traditional south indian cotton , that is fine and getting very soft after few washes. Honestly when i put them first time to try i honestly didn t want to take them down. I ve took inspiration for embroidery from old egiptian ornaments. In down part i used some elastic stiches so it could fit perfectly and tight and it is closing on a side with zipper. 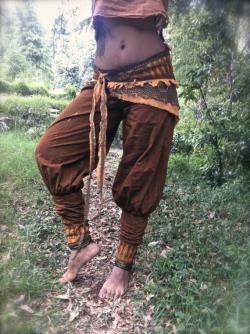 Beauty of this pants that it is actually two pieces in one , so you can wear it without belt (look at last picture) and to use the belt with other outfit as well. 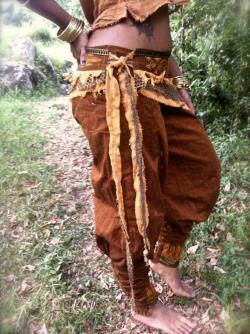 Belt made with additional raw cotton and crochet fabrics. You can see more detailed pictures in items for sale : separate belt and pants without belt. If you need bigger sizes please inquire. Will be perfect match with those tops. If you order those pants in cream , so you can have that top as a match.